The North American Surgical Robotics Summer School is taking place this week at CSTAR (Canadian Surgical Technologies and Advanced Robotics), chaired by Terry Peters, of Robarts Research Institute and Rajni Patel, Engineering Director at CSTAR. 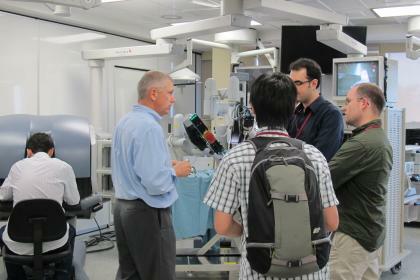 Sixty-five graduate students and early-career researchers from across the United States and Canada, as well as some from Japan, Qatar and Denmark are registered for this intensive Surgical Robotics Summer School. The participants have mostly a science or engineering background. It's not aimed at the medical community, but rather on those doing research and developing technology for use in the medical field. This event alternates between Europe and North America. It is the third time it is taking place in North America and the first time in Canada. The other locations were at Johns Hopkins University, Baltimore and the University of Washington, Seattle. Five similar Summer Schools have been held in Montpellier, France, where the concept originated. A distinguished faculty of 24 experts, half of whom are from outside of London, will present focused lectures on a range of topics, including: surgical robotics, haptics and teleoperation, medical imaging, image-guided interventions, major therapy delivery techniques, surgical simulation, training, and performance assessment. 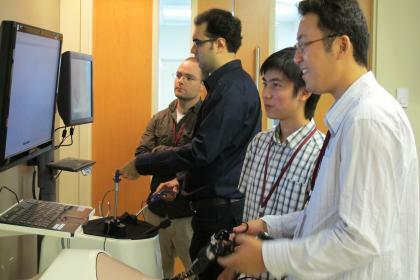 Hands-on experience will be provided at CSTAR in its surgical, engineering and simulation laboratories. The attendees will also have opportunities for informal interaction with clinicians and leading experts from academia and industry. Peters says "it's been an exciting week, beyond expectations," and adds that this puts Western on the radar with both the Summer School students and speakers for future academic and employment opportunities. "They now know what a unique resource we have."